I have a secret for you basil growers out there (who isn't a basil grower?). It is all about the prunin'. I've got this thing down to a science now. You see, I LOVE basil. Mostly because it is one of the only edible plants I seem to be capable of growing. The problem was, it would get all "leggy" and stop producing those really nice, big, delicious leaves of my younger plants. As a result, I had a Basil Minor League system in my backyard that would rival any Major League Baseball organization out there. As soon as one basil plant started to transition from AAA (almost there) to the Big Leagues (harvesting leaves), I would start a new Rookie league in another pot (seedlings). Well, those days are over! Who knew, but there is this thing called Google filled with people a lot better at basil growing than me! Now instead of just picking leaves, I prune each branch about 1/3 of the way down from the top, just above a set of small leaves. I now have a pair of basil bushes that any person would be proud of showing off to their friends (I'm ordering an "Ask Me About My Basil" T-shirt in another Safari window right now). All this really just serves as a warning to you loyal readers and Grill-It! users. 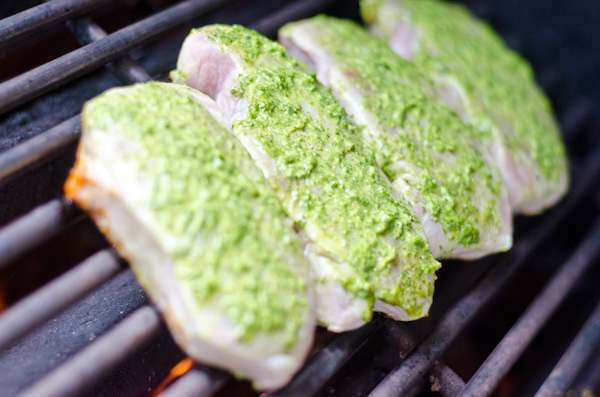 You are going to see more basil-related recipes from me this Summer, starting with these awesome grilled pork chops. Basil is difficult to use in grilling because it burns so easily. That means you have to mix it in with an oil or other fat to protect it from the extreme heat. This recipe is really easy to throw together at the last minute and the results are delicious. 1Combine everything but the pork chops (duh) in a food processor or blender. If you don't have a micro grater for the lemon, just double the lemon juice (and then buy a micro grater next time you are out). 4Rub both sides of the pork chops with the wet rub and then place in the refrigerator for 30 minutes. 5Light the grill to medium-high, close the lid and let the grill heat for about 15 minutes. 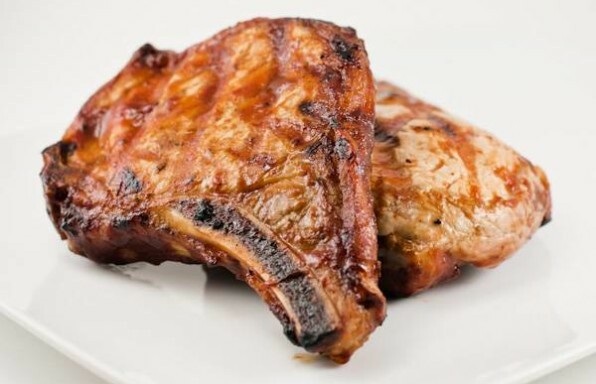 6Remove the pork chops from the refrigerator and place on the grill once it is good and hot. I like to use a brush to brush any remaining wet rub from the plate onto the top of the pork chops. 7Grill for 5 - 6 minutes over direct heat with the lid open and then flip your pork chops. 8Grill for another 5 - 6 minutes and then check the internal temperature of the pork chops for doneness all grills are different and it also depends on the thickness of your pork chops, so I can't tell you exact times. Please use a meat thermometer, along with the MeatTemps app to check for doneness. 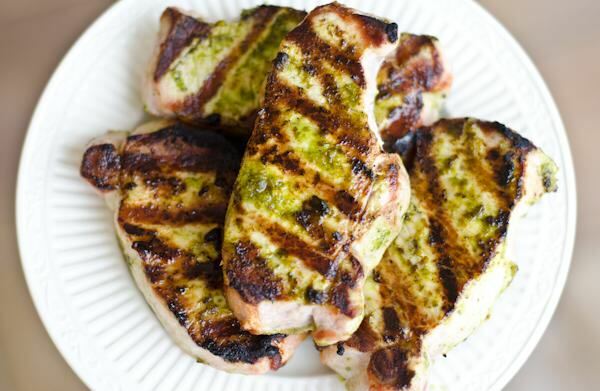 If your chops are a little thicker and need more time, lower the heat on your grill to medium, close the lid and bake the chops for a few more minutes. 9Remove the pork chops from the grill and serve.